Magic and Deviltry in the Crossroads City! 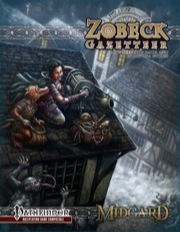 The Zobeck Gazetteer brings award-winning designer Wolfgang Baur’s Free City of Zobeck to life! This is where the campaign setting of Midgard was born: in the twisted alleys of the Kobold Ghetto, the schools of clockwork magic, and the ticking hearts of the gearforged PC race. Anyone looking for a new and different setting will find a clockpunk city forged in the fires of revolt, with monsters and magic drawn from the dark folktales of medieval Eastern Europe—plus details of devils, kobold kings, and plots galore! Plus a clockwork wizard school! Illustrated with beautiful city maps by Sean Macdonald, the gazetteer format provides just enough detail to incorporate Zobeck into any fantasy campaign without being overwhelming. Come on down to the crossroads and try your luck! The Introduction opens with a key question: What is Zobeck? Seems a good place to start, and the text explains how Zobeck is one of the few places in Midgard not to have a feudal overlord since a revolt some 80 years ago kicked out the ruling family... not to mention that it's a trade hub and by all accounts a vibrant and exciting place to live in or visit. If you don't happen to use the Midgard campaign setting, a helpful sidebar explains, it will not take too much adaptation to locate Zobeck in your own game world instead. It's a town with a dark side, a teeming underbelly. It conducts trade primarily by river, and there's a deep, dark forest nearby. Inspiration includes middle Europe, a rich source widely ignored by fantasy game authors. Chapter 1: A History explains the genesis and growth of this city-state and how its main inhabitants - humans, dwarves, gearforged and kobolds - developed the relationships that they have today. First there were the Fey, who were tricked into a pact that resulted in them becoming the Shadow Fey but gave them so much power that they don't seem to have resisted much. Then kobolds turned up to exploit the wealth they found underground. This annoyed the Shadow Fey who formed an alliance with a human lordling called Stross, who conquered the area and established his own rule... and thus the seeds were laid for what is found today. Interestingly, all the history recounted here is information that any interested character might find out, while it's probably common knowledge to the locals. Next is Chapter 2: The Free City of Zobeck. This is a survey of the districts that make up the city and the people who live in them. Everyday life, customs, languages, trade... it's all here, vital information for would-be visitors. There are also ideas for adventure scattered throughout, which can be picked up and developed by interested GMs. This chapter ends with notes on the city's neighbours. Then comes Chapter 3: The Kobold Ghetto which goes into extensive detail about this fascinating district of the city. It may be a tough place to live, but compared to what kobolds have endured in the past it at least provides some security if not much in the way of creature comforts. There's plenty of information and a detailed map to facilitate visits - although non-kobolds do stand out and often get picked upon. Indeed, the ghetto is so alien a place that visitors actually are dazed (as in the condition) for several rounds on entering! There's plenty to see for those willing to brave it, however, and numerous ideas for adventure are provided. Moving on, Chapter 4: Districts & Locations surveys the most prominent ones, with a 2-page map depicting the entire city and a wealth of notes and details about what is to be found there. There are places to visit, shops to browse in and fascinating individuals to meet... and of course several good taverns to drink (and brawl) in. Scene set, the next chapter - Chapter 5: Gangs, Guilds and Guardians - gets down to explaining the elaborate guild organisations that (at least in their own eyes) control the city as well as the numerous gangs which also lay claim to do so, certainly where the underworld is concerned. You can also find out about the local courtesans, including their habit of getting rival lovers to duel over them. Whilst the city is no longer subject to noble rule, 'society' and courtiers still flourish and those who wish to mix at such rarified levels (or in some way profit from them) will find the details that they need. Next, Chapter 7: Denizens of Zobeck provides full stat blocks and details of several notable NPCs dwelling in the city, all ready to be woven into your game. Finally, Chapter 8: Magic of Zobeck takes a look at magic as it is practised here. Dominated by the Arcane Collegium, there are some interesting paths of magic and they are explained here: the clockwork school and the Gear domain, along with star and shadow magic which both fall under the school of illumination magic and are held to be unique to the city. For those interested, there are quite a few new spells to study as well as a magic shop to visit and some magical items to keep an eye out for during your stay in the city. There are a few annoying typos (although you can make out what was intended) and a few references to the Streets of Zobeck supplement: it's probably best to pick up a copy if you want to make best use of this book. Whilst much of the information, especially in the first couple of chapters, covers things that a character might discover through inquiry or research, later material is probably best kept for the GM's eyes only, even where characters born and bred in the city are concerned. Overall, though, it is well-presented and brings a fascinating city to vivid life - the party will remember their visit for a long time to come! This pdf is 117 pages long, 1 page front cover, 2 pages editorial/SRD, 1 page ToC and 1 page back cover, leaving 112 pages of content, so let's check this out! This pdf consists of a gazetteer in the truest sense - it starts with an account of the history of Zobeck, the by now famous clockwork city. From a history steeped in mystic lore and the interaction of the infamous Stross-family with the shadowfey to the recent rebellion that made a free city out of Zobeck, saw the advent of gear-forged guards and the freedom of kobold miners, the history-section of the book is written in compelling prose and provides enough fodder for campaigns aplenty alone. Current Zobeck is a vibrant city and thus, we first get an account of the city and its structures as a whole, from government, guards etc. to the unique festivals of the city. Life and culture in the city of clockworks is detailed in excruciating, vibrant detail, bringing to life one of the most iconic cities of Midgard and neighbors like Morgau and Doresh, the near Margreve and the Ironcrag dwarves will ensure that Zobeck never runs out of the need for adventurers. Perhaps the most iconic district of Zobeck would be the Kobold Ghetto and it is detailed herein in as of yet unseen detail, including a vast variety of (often humorous) traps and hassles for the big folk to encounter. The cartways and different districts of Zobeck are covered in similar, yet not as extensive detail and their locations provide adventure hooks galore for enterprising PCs. If that still does not satisfy your locale-needs (have I mentioned the shadow-fey embassy? ), the surrounding area also gets a brief glance. Of course, all these locales have to be inhabited by people and said people tend to organize - from weavers using automatic spiders to gangs, the spy-networks of the mouseking and the spyglass guild, the diabolist cloven nine and several other cabals and guilds, there are plenty potential intrigues waiting for the involvement of your PCs in tha tangled webs that are the city's politics - and that's before the gods, cults and religions (fully detailed, btw.) of the city come into play. It is also here, the great crab-divining of the Kariv is detailed alongside patron saints, relics, reliquaries and of course, Rava's great oracle, which guides and protects the city's destiny. The "Denizens of Zobeck"-chapter provides us with fully stated characters, including golden-scaled kobold paladins, the infamous mouse-king and other movers and shakers. Since Zobeck features two distinct sub-schools of magic, gear-magic and the star & shadow-school, the magic section of the gazetteer is well-developed and provides additional oomph for casting characters alongside spell-lists for the core and APG-classes, but not for the poor magus. Editing and formatting could have been better - Open Design needs to get more proofers/passes at editing, for the writing is superb, but more than once broken by easily avoidable glitches. Layout adheres to a beautiful 2-column b/w-standard in full color in the pdf. I don't understand why the print version is b/w, though. The artwork used throughout the book is stellar and should satisfy the most discerning of purchasers and comes with a mix of abstract, grimy and clear, classic pictures, most of which are b/w. The pdf is extensively bookmarked. So this is it - my favorite city in Pathfinder gets its own gazetteer. And it's a tantalizing read - in the positive and negative sense. On the one hand, the lecture of this book provides you with information and hooks galore. On the other hand, this information refers to a lot of other books, unfortunately including the now no longer available first Open Designs. I can't tell you how badly I gnashed my teeth each and every time I read "See Steam & Brass" or "See Castle Shadowcrag", the two I couldn't as of yet get my hands on. Additionally, I now hope even more so than before for a PFRPG-conversion of "Courts of the Shadow Fey". Moreover, the pdf often refers to two as per the writing of this review not yet released books, the Crossroads Player's Guide and the Midgard Bestiary, leading to further teeth-grinding, but also joyful anticipation. The writing in this book is superb and befitting of the great content Tales of Zobeck, Streets of Zobeck etc. have provided...which brings me to a major bummer, at least for me: While it is nice to have the information compiled, a lot of this book is a rehash of old material - KQ-articles, information from Tales of Zobeck (updated to PFRPG, though) and Streets/Alleys of Zobeck are heavily quoted. Especially the former two have whole slews of characters, including statblocks, just reprinted, artworks reused etc. And I don't get why. they are written for PFRPG and freely available. Why take so much of the content from these books instead of providing new one? Don't get me wrong, I love AoZ/SoZ, but I would have loved to get even more new content or rephrased old one - perhaps a rule for a certain mother of gorgon's blood-infusions or more unique cultural practices like crab-divining, something along those lines. It is due to this, at least in my opinion, slightly exaggerated recycling, that this book loses another half star. Combined with the avoidable editing glitches, we thus arrive at a final verdict of "only" 4 stars in spite of one of the best writing jobs I've encountered in a setting sourcebook and still a definite recommendation. The PDF weighs in at a healthy 117 pages, with covers (front and back, full color w/ illustrations), OGL, ToC and Intro pages all taking up 7 pages total. That leaves us 110 pages folks, 110 pages of material, art, items, history and stories. The artwork ranges between sketch and more refined illustration, with both color pieces and B&W. Each chapter opens with a full page B&W illustration, and very much reminded me of several old school rulebooks in that nature. Fully bookmarked for ease of navigation (always a good thing), the PDF carries a blueish tinge to the pages, so I'm going to have to recommend buying a printed copy, as opposed to printing one. Grammatically there are very few mistakes, although one stuck out like a sore thumb and had me chuckling. page 9, second column, second paragraph...", but th'wwwwqwe things that still abide in Strossheim (now called Shadowcrag) have not forgotten". Am assuming the word should have been "those". For those not in the know, Zobeck is a city, at its simplest description. But to stop at that would be nothing short of insult to the material, and the people, who over the years have helped define Zobeck into the living breathing locale it has become. I wasn't on board for a great deal of the earlier material for Zobeck, I will admit that. I can't tell you how much here has been collaborated from other, older material. Nor can I tell you what has been converted from previous rule sets. I can look up the previous releases, and hunt for them (and I did), but a cover and synopsis will only tell you so much. And in the end, the review is about this book, this gazetteer. I mention the older releases because, at least to me, when I realized I was looking at a book dealing with a setting that had previous material, it became important to me to know how well received the previous material was. Everything I saw tells me, this city, this locale, has all of the personality and presence of character required to leave a mark upon a gamer's life forever, and it's troves of fans agree. Zobeck is the type of place one wants to adventure to, and in. A city free unto itself, with the opportunity for any and all to make a name, or at least some coin, for themselves. The people of Zobeck are primarily human, but the second highest population in this city are the kobolds, and that folks, stands out. Name me another predominately human society that tolerates kobolds enough to share their city with them, go ahead...I'll wait.........my point exactly. So, why? Why kobolds? Because the kobolds helped fight in the great revolt that lead to the city throwing off the shackles of nobility in the first place. They helped Zobeck become a free city, and then negotiated for the rights to continue working the mines, not as slaves, but as free “men”, earning a wage. The Grey Friar: A local tavern, one of the more famous, brought up in the section on Inns, Taverns and Alehouses along with several other taverns is also mentioned earlier within the book in regards to a local gossip about a gargoyle living amongst it's rafters. We No Work Day! : Ever feel like calling in? We all have, and apparently when the kobolds do it, they all do it, literally. Once, sometimes twice a year, they simply take the day off, and declare it a holiday. Spring Festival: A night of lustful abandon celebrated citywide in the name of the gods of love. Hrovitz: The family of Halsen Hrovitz, a ten year old boy at the time, was the spark that started the Revolt that led to the freeing of Zobeck from the rule of the Stross family. Halsen was simply a boy, vocalizing his opinion of the Stross family when the city guards grabbed him and began to drag him away, but on that day, people did not get out of the guard's way. One simple act of defiance, and the city as one fought back, and earned their freedom. Arcane Collegium: Mentioned several times, throughout the book. The one small section giving any details is maddeningly short. One can only hope that this will also be showing up in another book soon, as this locale is mentioned far to many times as part of this city to not have more details for. There are many references throughout the book to other books, leading one to hope that this gazetteer is to be one in an ongoing series of new books released in support of this setting, as opposed to these references being to older material that may be harder to find for newer customers. Zobeck functions in many different capacities, as a trade city with routes following roads, river, flight and even a path to the realm of the shadow fey. One can find a great many things within the stalls and markets of this city, making it a great resource for both PC's and GM's alike. One thing that must be mentioned, a thing that truly establishes Zobeck as vastly different from many city settings within the fantasy genre, are the gearforged. Gearforged were first crafted during the revolt, and as such are amongst the few who can say, these 80 years later, that they were there to see it first hand. Think of them as steampunk cyborgs, with a healthy dose of magics and clockwork technologies making the impossible a very common reality within this city. The concept of clockworks and gears being so infused into the cities heart, that their main religious loyalty's lay with Rava, the Gear Goddess (OK, obviously, if you are planning on dropping Zobeck into your own setting, you'll have to decide what to do about their patron Goddess, but that's easy enough to deal with). As with any city setting, there are the different districts; Gear, Temple, Market, Merchant, Upper, Lower, The Docks, Collegium, and the Kobold Ghetto. There are also two basic ways to make your coin here, one side of the law, or the other. Those caught breaking the laws will find that their GM's are prepared for them, as there is a full breakdown of crime and punishment handled, with fairly established concepts of justice and fair retribution. For those playing within Midgard, the sections detailing the neighboring cities and kingdoms will be of much more usage than to those like myself, who intend to drop Zobeck into our own worlds. Regardless, each of the neighbors are given a quick well detailed section giving a GM enough to work with from this book alone to be able to handle contact. The Keeper in White: kobold clockwork lich wizard 12, yeah, mouthful isn't it? This dude, an albino kobold over 100 years in age, has a mithral torso, and a clockwork heart. He's obsessed with keys, and lives in a locale known as the Throne of Keys (as it's filled with thousands of stolen keys). Lady Fenyll Marack: Praetor of the Blue House, Lord Commander of the Free Army of Zobeck The only publicly known member of the 5 person secret council known as the Praetor. The Praetors serve as inner cabinet to the Lord Mayor, as well as his eyes and ears throughout the city. Abrostar: Gearforged owner of the Grey Friar, has a love of learning and memory that set her apart from other gearforged. Her tavern/restaurant may not have the best tasting food, but it's cheap and her seats are always filled after service at the temple to Rava end. And before the wrong impression is given, there are full write ups and statblocks for the notable NPC's later within the book, I am simply pointing out the initial introduction to many of these NPC's is handled in a better manner than simply cramming them together at the end of the book, or breaking the flow of the text with scattered statblocks everywhere. We are given a two page map of the city, with numbers for locales (sorry Endzeitgeist) that where as are not of the greatest artisitic style, are functional. It reminds me of a hand drawn map, which I am not a fan of in works of this level of professional quality. We are also given a map for the Kobold Ghetto with more detailed locations as well. Several locales end their small descriptions with (see another book page number x-z) which personally, I'm not sure how I feel about. I am hoping that we are being pointed to other books when it comes to these locations because there is a much more detailed writeup and maps for these places to be found in these other books. I could not help but notice that where as the map has numbers for locales to be matched up to, and a great deal of the locales have numbers, a great deal don't. Which left me wondering where those locales were in regards to the city. Several gods are detailed within this PDF, and are mainly of use for the setting Zobeck is intended for, but amongst the gods one will find a few interesting gems that are ripe for plucking for any setting. The Lust domain, which screams do not use unless you have a mature play group, and the secrets to Divining The Shell (Divination using crabs). Obviously the Lust domain is what it is (for once, go ahead and get your mind in the gutter, your right this time), it's the crab divination that offers up so many freaking possibilities. If you have never used divination within your games you are missing a really cool way to not only get information into your players hands, but to seriously screw with them as well, lol. Tick Stop Watch: The slot is for feet, even though this is a stop watch....strange place to carry a stop watch, just saying. Signet Ring of Karremark: Am assuming the kobold ring is supposed to weigh .5 lbs, not 5 lbs as it is listed. Otherwise, I wanna watch that kobold arm wrestle someone. LifeBlood Gear: Am not entirely clear on how this works, or why it takes up the shoulder slot. By the description, reading through it the first time I was thinking it literally created out of thin air a small animated object after the gear was attached to one of the three targets. The second time I read it I started to wonder if it was supposed to be animating the thing it was attached to, even though a size ratio for the targets was not given. Either way, I do not understand the shoulder slot. OK, final thoughts, buy this book. Period. There are a few hiccups, but none of them were enough to derail the sheer awesomeness of Zobeck. As a setting taken as it is, or plucked from its landscape and relocated to your own horizons, this city rocks, and your players will love it. One of the easiest 5 star ratings I've ever given. Is this going to be the update for the 3.5 Gazetteer that accompanied the Tales of Zobeck patronage project or is this a new book? An expanded version? I just finished working on the expanded book. It will include information presented throughout various OD projects, including Castle Shadowcrag and Steam & Brass, as well as the Kobold Quarterly articles that have been printed since the original book came out. So, it has the material of the old Gaz, but it has so much more within it. Btw, the clockwork creatures have been moved to the Bestiary project. Updated spells are in the Gaz. Yes, you will get the full understanding of the history of Zobeck presented in that book, plus some info from Steam & Brass. Their entire contents are not in the book, just things that were important to understand Zobeck and some of its listed people. More from the former book than the latter, actually. Excellent news! I'm looking forward to seeing the completed Gazetteer. Any ideas about the final page-count? The manuscript came in long, so the page count is easily over 100 pages, maybe somewhere around 112. The exact size depends on editing choices and art/maps as well. Double the size of the original gazetteer, easily, and all Pathfinder. Wolfgang will need to answer that, but I'm guessing 96+. Sounds like a really cool product though! Not sure on that point. Probably, though. Yes it will have a bundle! If there will be a print+pdf bundle what will pre-ordering here get me? Just the pdf? ETA is mid-to-late January. Well before the 31st. And yeah, we have a final cover that I should send to Liz. Looking forward to seeing this in my hands!!!! Very much looking forward to the Gazetteer. Zobeck is the big city in my campaign and my players all have found it to be a memorable place, and have strong opinions when asked about the city. . . . This update is something I've been waiting for for a long time. Looks like it is 118 pages total for the PDF and 115 for the content, excluding things like covers etc. Yep, Tracy, it's a decent-sized book, and it pulls in information from the supplements that folks can't get. Print/PDF bundle and PDF now available! And by expanded, I mean “more than doubled in size” and “including everything about Zobeck from every issue of KQ in the last 5 years”. I might be biased, but this is a really great city book. Must really be getting old not to have seen it earlier. The print versions were delivered to Paizo yesterday, should be dropping out of preorder status pretty quickly. As much as I am planning on using some of the encounters from Tales of the Old Margreve, I thought I had better get this just to be sure there isn't something else from Open Design I couldn't use in my homespun campaign. I know there is small entry on page 49, but surely this is not the complete write-up? Brekkil, the full info on that is in Steam & Brass, which was a closed patron project. There is a bit more info on the Collegium in the new Gaz. There should be maps for it, too, but I'll let Wolfgang confirm or deny that. I would remove the "complete write-up of the Arcane Collegium" bit, since there isn't any. This is part of what sold the book to me, as it got me curious, and at the very least I was expecting map(s). I was hoping to find something that I could use for my own setting. Sorry about the maps. I had forwarded some for the project, but space and/or time limits may have removed them. The ad copy does need to be adjusted. There was a map for the project, but it was cut during layout due to space constraints. Agree on the ad copy, and I've asked for a change. Also might want to remove gear and feats, since those are in the Player's Guide to the Crossroads that's in editing. Well, there's actually quite a bit of magical gear in the Zobeck Gazetteer, such as the various boots, cloaks, unguents. Less so on the feats, true. I was calling them magical items. :)Ok on gear. Oh, and just to make this book even cooler, I have uploaded a version with a 3-page index. I know, so old school, and yet really, really helpful. Possibly even worth adding a bullet point to the store description. Woah. The cover art alone is making we want to buy this. It might be what you're hankering. There's a city map. It's a two-page spread! However, if you really want city location maps, I strongly recommend Paizo's Gamemastery Map Pack. It's all maps. I stand corrected. Here I got all confuzzled by the comments above about no maps, and then I zipped through it quick and didn't immediately spot them, and now I enjoy the delicious taste of shoe leather. Mmmm! Now with gear grease! What I really do love about this book is that it has cross references between other Midgard/Zobeck material. Wondering where a particular NPC might crop up? Oh, well that's mentioned in the entry-- and that's gold, in my opinion. Yes, there is a city map, but what happened to the colour version from the original gazetteer? The color version of the city map is available as well. It is poster-sized, and thus does not fit into a standard-sized book. I agree that the Collegium does deserve its own book. I would very much like to see a collegium book. My current party does a LOT of business with the collegium, and I'm happy to make stuff up, but could really use some more information.